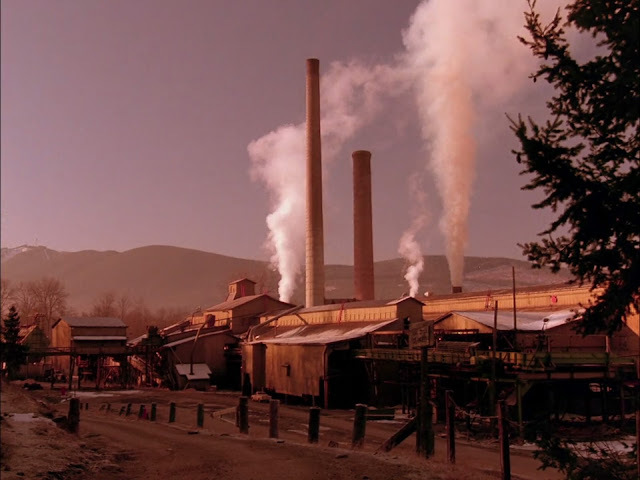 This was the former Snoqualmie Falls Lumber Company mill, and I mentioned in an earlier post that in an interesting Twin Peaks-related twist, some of the timber that used to hold up the lumber mill is now used in the shed protecting the Giant Log from the opening credits. So it all comes full circle. Funnily enough, the mill grounds are now part of a rally racing circuit. But yeah, the mill itself is basically gone. In fact, it was mostly gone already during season one of the show, when it was downsized into a much smaller mill. 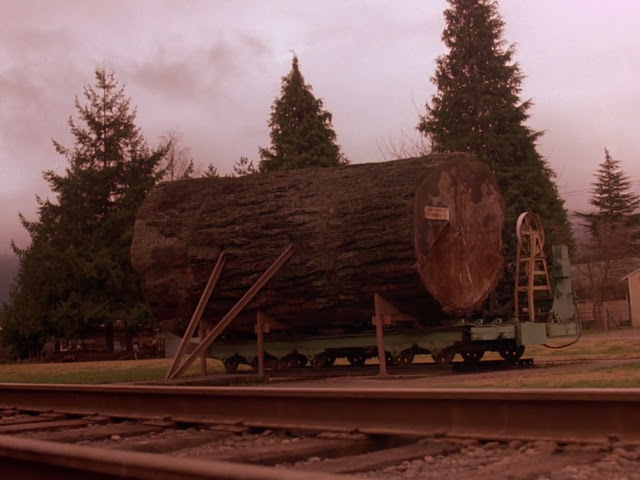 The giant log as seen in the Twin Peaks credits sequence is still there in Snoqualmie, exactly where it always was, but it looks quite a bit different than it did in the series. While the series had it sitting imposingly out in the open on a cart on the tracks, the town of Snoqualmie has now built a protective shed around it along with viewing benches and a large iron fence. This has the effect of diminishing its stature, although it was probably a necessary evil as rain is the enemy of dead wood and even with the fence, kids are still figuring out ways to write graffiti on the log. That damn Bobby Briggs! You can see that the log itself has deteriorated somewhat, but the telltale bark pattern on the left side of the log is still there, as are the holes for the 2x4's that used to hold it steady. It's clearly the same log; time has just had its way. The Snoqualmie Falls Lumber Company sawmill is the Packard Sawmill. In the lower right box there, you see that the timbers used in the building of this woodshed were recycled from the remnants of the old mill. So even the shed here has a connection to the TV show - this same wood may have been seen in the Packard Sawmill interior in the pilot episode! 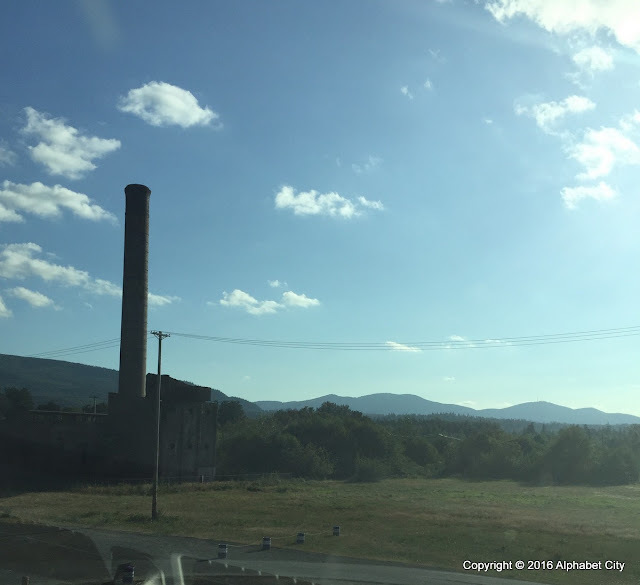 I'll have more on what's left of the Packard Sawmill in another post. 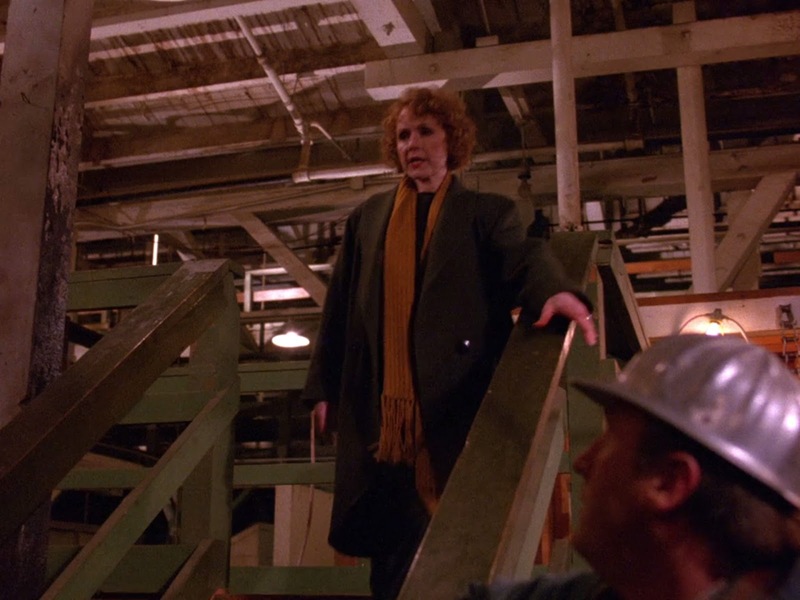 One of the central events of the Twin Peaks pilot was when a partially clothed and obviously battered Ronette Pulaski stumbled across this railway bridge the day after Laura Palmer's murder, then immediately fell into a coma. Their cases must be related, but how? Their fellow students all agreed the two girls barely knew each other. 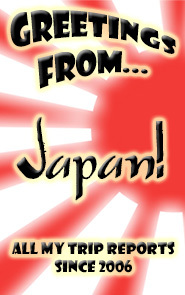 Ah, yet another piece of the mystery unfolds! We stumbled onto this bridge by accident, although we had planned to seek it out eventually. 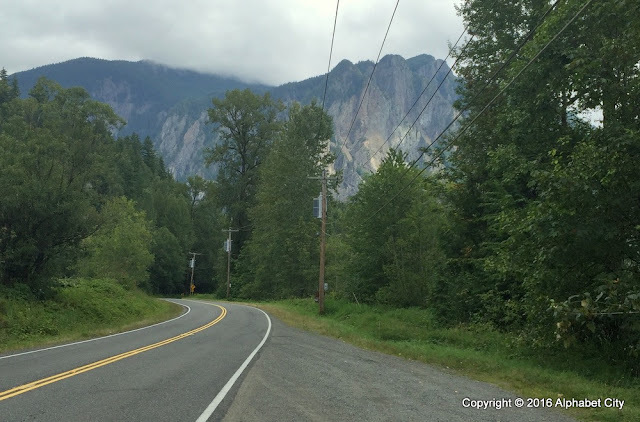 But it is literally down the road from the Twin Peaks welcome sign - as we were driving, it suddenly appeared out of the wilderness in front of us. As a New Yorker, I like to think of this as "The Ronette Pulaski Bridge" - that sounds fitting and familiar to me. Its real name is the "Reinig Bridge", and it was originally a trunk line meant to shuttle lumber from the Snoqualmie Falls Lumber Company mill (aka the Packard Sawmill). In person, it's obvious to me why Lynch and/or Frost wanted to use this bridge in the show. It sticks out oddly as a dilapidated, imposing, industrial structure in the middle of beautiful forest greenery. 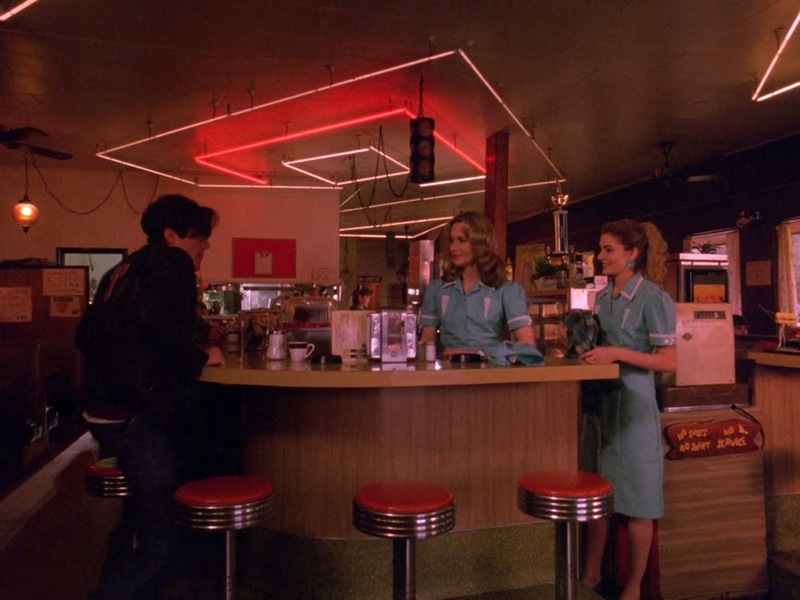 Agent Cooper's go-to place for a damn fine cup of coffee and a slice of cherry pie still exists, and in fact looks basically like it did in the show. 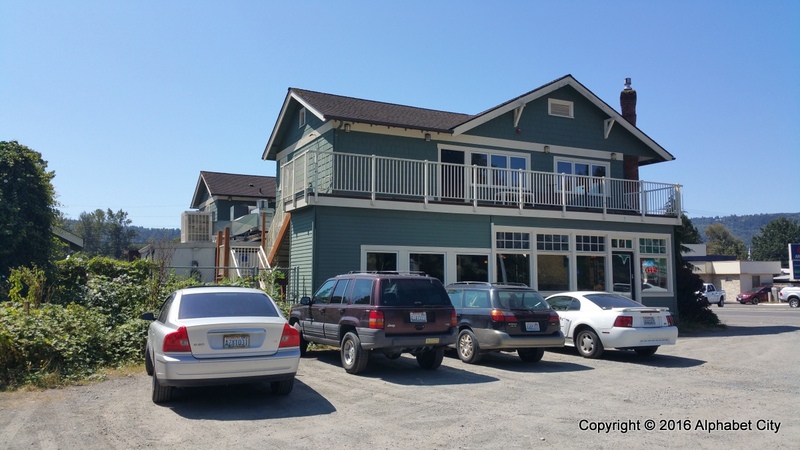 Its real name is now Twede's Cafe, formerly the Mar-T (or T-Mar, depending on who you ask) after an ownership change or two over the years. Twede's is in North Bend, one of the two main towns that make up the "town" of Twin Peaks. 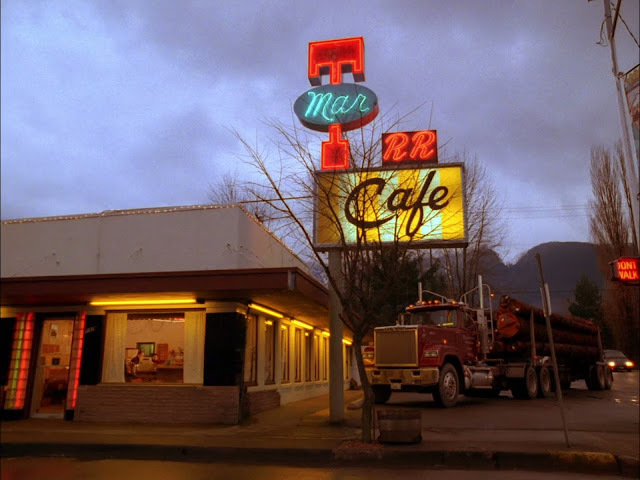 You will notice the "RR2GO" graphic above - in fact this is one of the few Twin Peaks locations that really embraces its connection to the show. Some may actually find this off-putting - it's clearly a tourist attraction at this point. We were surprised that that was still the case, 25 years later. 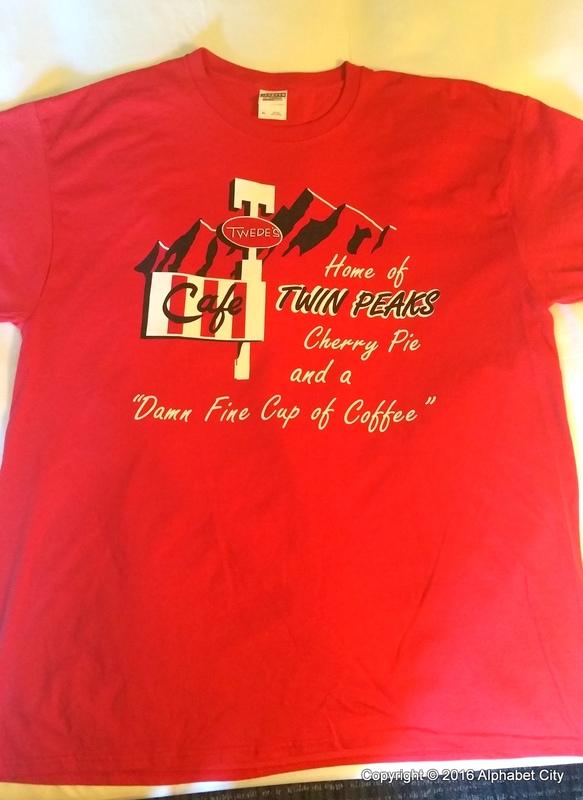 But the waitstaff told us they got Twin Peaks fans from all over the world. 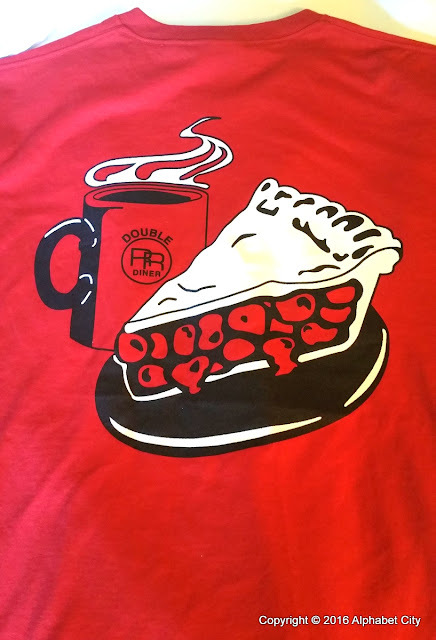 BUT - and this is a big BUT - they do have a damn fine cup of coffee and the best cherry pie this side of the Mississippi. Yes, it really is amazing pie. My wife and I even went to our favorite local bakery after coming back just to make sure, and their pie IN NO WAY COMPARED. The pilot episode was filmed inside the real Mar-T Cafe, on location as most of the pilot was. Obviously, that meant a lot of traipsing around the Pacific Northwest with heavy equipment, not to mention the framing and lighting challenges that seem obvious above. 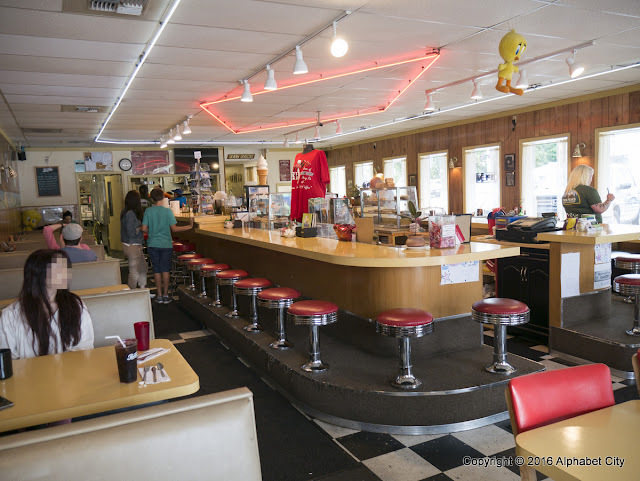 But if you were to visit the Mar-T Cafe right after the pilot filmed, it would have looked exactly the same as the show inside. In fact, it's now laid out and styled pretty much just as it originally was, with most of the same decor, right down to the wood paneling. (The wall to wall carpeting is gone, with a floor more of an homage to the later episodes - an understandable tradeoff.) There does seem to be one fewer stool - I'm not sure if the counter is smaller or there's just more space between stools. This apparently was actually paid for by Showtime specifically for the Twin Peaks reboot. Lucky timing on our part! But it is a permanent remodel. The Double-R in Twin Peaks was a set in California after the pilot episode, rebuilt there for ease in filming and transport costs, and consequently the diner you see through most of the series - while the actual Mar-T/Twede's Cafe exterior - is actually quite a bit bigger inside. It's styled to look like Twede's, but just keep in mind it is a set, lest you start wondering why certain things don't look quite right ("there are too many booths!" 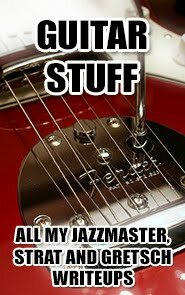 or "there's too much space in front of the jukebox!" or "why don't they ever show the view out the windows?"). We even felt like we got the full waitress experience - I'm sure our particular waitress is probably sick to death of hearing it, but she was a pretty good ringer for Shelly Johnson. Unfortunately the waitstaff no longer wear those 50's style uniforms - they should! They have t-shirts in black and green as well, all with different designs. I liked this one the best. Unfortunately it runs a bit small, so it's probably just a souvenir now - wore it once and that's probably it. If only Twede's had a web store, I'd get another one a size up. 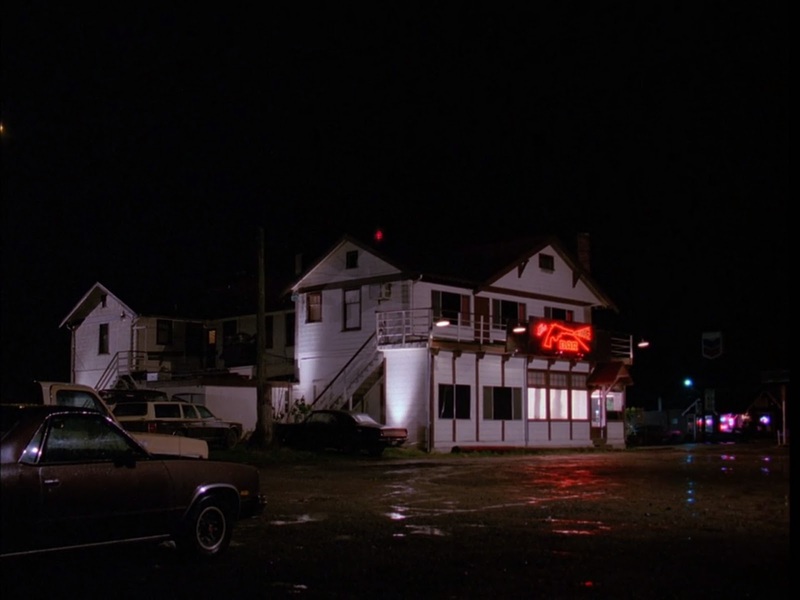 The Twin Peaks Roadhouse is one of those locations I almost didn't think of as worth visiting - it looks nothing like the show inside, it's been painted green since the show, and I somehow knew they were actually showing the back of it in the series. It was even called the Colonial Inn until very recently. The exteriors used in the show were filmed a little further to the back (this is mostly the right side of the building; the back side is on the left), but there's now a gate and fence there that prevents you from moving any further. I'm guessing they used this angle both for the unpaved parking lot (the other side has a paved parking lot) and the fact that it hides the road out front, especially when filmed at night as it typically was. Yes, it is actually popular with bikers! That's the Roadhouse Burger with caramelized onions added. The interiors of the Roadhouse were actually filmed in Seattle, at a place that was once a gay bar but is now apparently a dance studio. I didn't visit there. 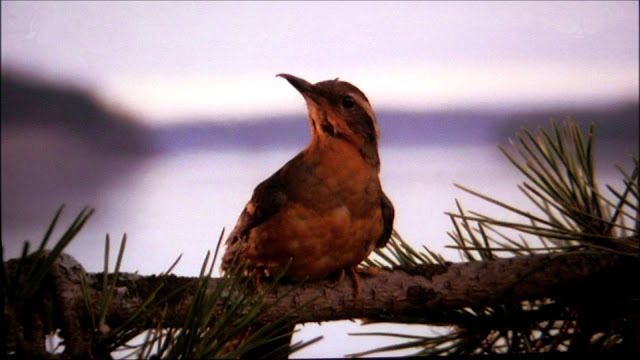 The beginning of the pilot episode opens with Pete Martell discovering Laura Palmer's body just outside his home at the Blue Pine Lodge, setting off the central mystery of the entire series. Her body had been deposited along the river banks at high tide next to an enormous toppled log. 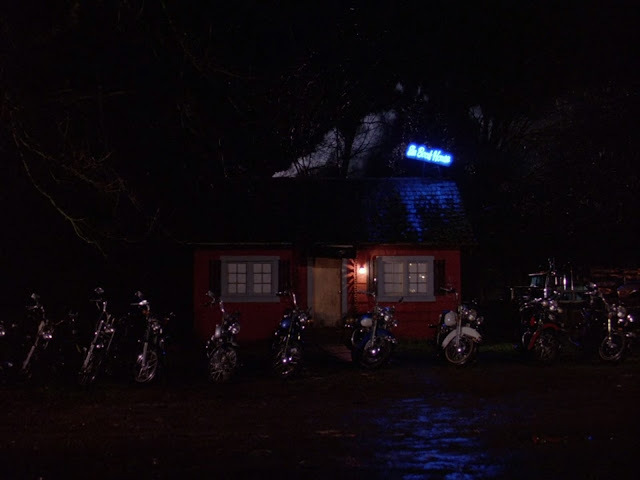 These scenes were filmed at the real-life Kiana Lodge in Poulsbo, Washington, one of the more faraway locations from the rest of the "town" in the series. 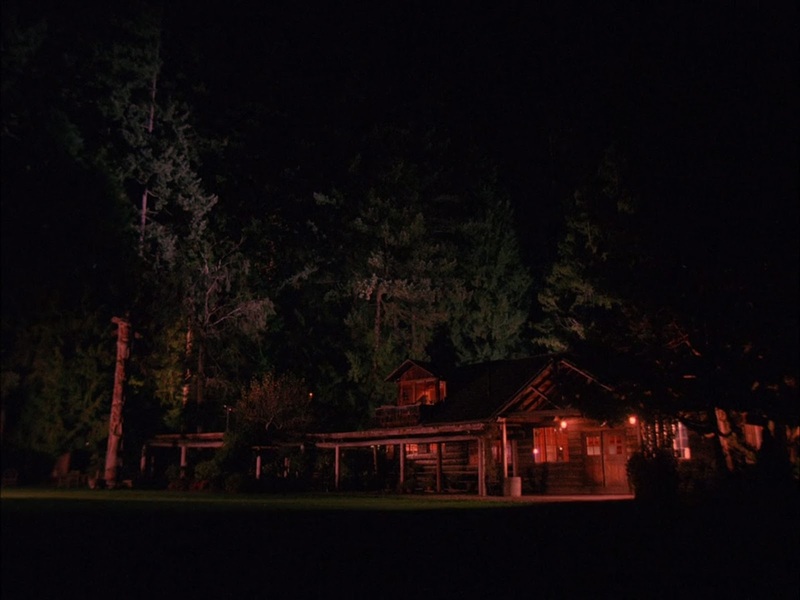 Even in the series it looks like it's probably on the outskirts, but Kiana Lodge is literally about 60 miles away from Snoqualmie and North Bend, on the other side of Seattle! Believe it or not, Kiana Lodge is mainly a wedding space. It's rentable for events, but it's marketed specifically for wedding planners. No, nobody lives there (that I know of) - it's not a private house, though it is private property and we called while on our way just to make sure that nothing was going on that day and that the staff wouldn't mind us poking around a bit. They were very nice and even directed us how to get to the (in)famous log. There are actually several buildings at Kiana Lodge - the one shown in Twin Peaks as Pete's, Catherine's and Josie's residence is the one closest to the water (making for the best on-camera views). Fittingly, they were doing wood-cutting while we were there! They've done some work since the show, and the lodge looks a bit different now. Its basic structure is instantly recognizable, though, and the totem pole is still there. Laura's log is just to the right of the above photo - in the image at the top of the post, you can see the lodge peeking out to the right of Pete's head. The log is literally just across from the lodge. And here's the log itself. To think, Sheryl Lee was lying right there. The text says "A pivotal scene in Twin Peaks' pilot episode was filmed here in 1989. Laura Palmer was discovered right next to the immense log tethered before you." There's the Blue Pine/Kiana Lodge with the log next to it. Funny story: when jumping off that 2 foot high wall above the beach, I did a total faceplant. Sand and rocks all over myself and my camera. There's a lot of seaweed down there and the rocks are such that you can't really predict how your feet will sink in. 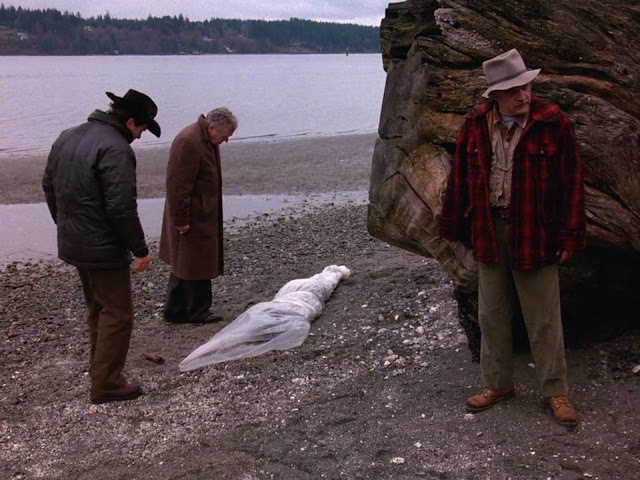 So now I can say I faceplanted on Laura Palmer's beach! Again, this may not be the same branch (remember there's been 25 years worth of extra growth, though), but there were only about three there hanging out like this and this one had the best angle. The real branch may have been cut, or it may have actually been a different branch that they held out at a specific angle. It's really impossible to know, but it was definitely one of the branches from one of the trees in this specific spot. 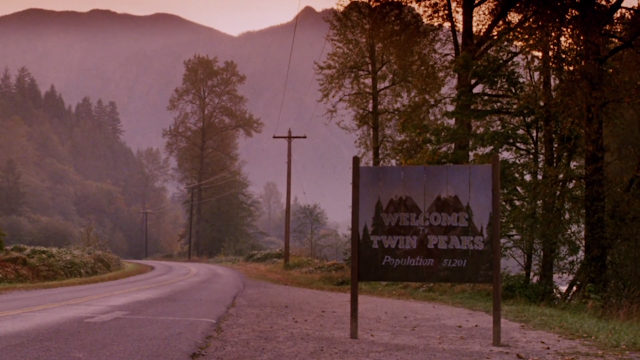 The Real Twin Peaks: Welcome! When Showtime announced a new season of the David Lynch/Mark Frost-helmed TV show "Twin Peaks" more than 25 years after its last, I'm pretty sure I squealed like a little schoolgirl. This has always been my favorite show of all time, and I'd always wanted to visit the various real-world locations used in the pilot and throughout the series. If you've never seen it before, do both me and yourself a favor and check it out on Netflix, because the next ten or so posts here are all going to be about it. Did you know that most of these locations are still there? In fact, many of them barely look any different than they do in the show. Some things have changed, but many locations are surprisingly well-preserved after a quarter century. I was finally able to visit them just last week, along with some of the famous locations in Poulsbo and Fall City, and my plan is to show them to you starting now. There are other web sites out there that go in-depth with the many shooting locations of the show, both in Washington state and in California. (Only the pilot and prequel film were shot on location in Washington, with the series itself mainly shot on sets in California, using previously-shot footage from Washington for exterior establishing shots). I didn't visit every single location and I'm not going to go that in-depth. But many of those web sites are several years old - some almost a decade old! While they definitely helped me in finding some of these places, I want to show you how the locations I visited look today, in 2016, and how they may look (assuming some of them are used again) in the upcoming season of the show. A little more growth (and a tree or two cut down over time), but overall still looks pretty close, right? This spot is not that difficult to find - believe it or not, it is actually searchable in Google Maps! In reality, it's one of the many turnouts on the roads in this area, where cars can either park for scenic views or turn around. In fact, this spot is really impressive in real life, as many of the real-world locations are. Those mountains loom large - something that doesn't come across on a small TV screen. 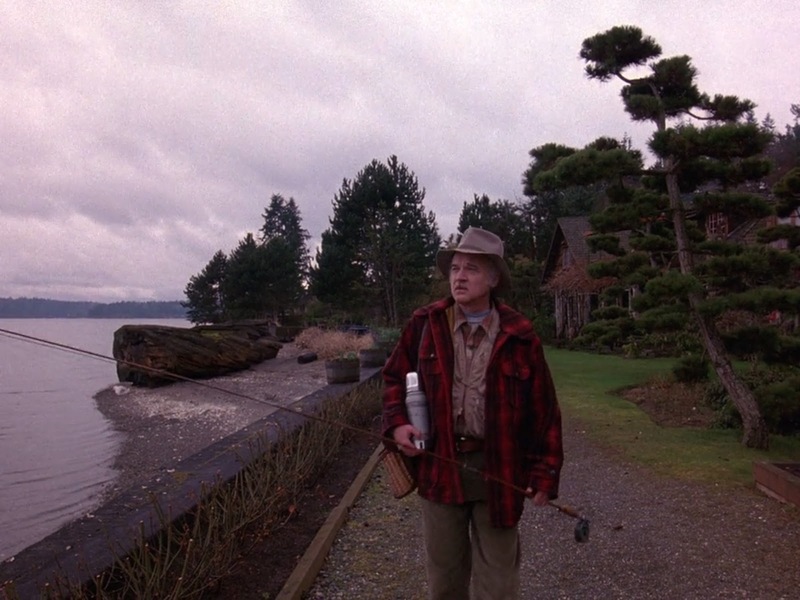 The real-world beauty of this entire area just can't be stressed enough, and it's obvious when visiting all of these locations why Lynch fell in love with Twin Peaks. The sign spot is actually just down the road from Ronette Pulaski's bridge, which we found by chance on the way to this turnout. Watch for that in a later post! I'll have more very soon.